The side curtain airbags help protect the heads of the driver and passengers in outer seating positions during a moderate-to-severe side impact. The side curtain airbags equipped in this vehicle are also designed to help reduce the likelihood of partial and complete ejection of vehicle occupants through side windows in crashes, particularly rollover crashes. 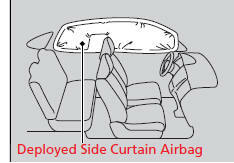 The side curtain airbag is designed to deploy in a rollover or a moderate-tosevere side impact. 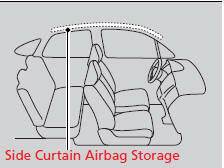 One or both side curtain airbags may inflate in a moderate to severe angled frontal collision. In this case, the side curtain airbags will deploy slightly after the front airbags.